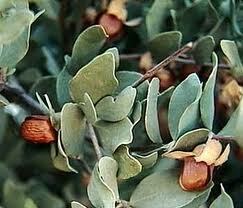 I remember when the very first Jojoba plantation was established here in Queensland. My partner at that time, was flogging off plots on this farm to unsuspecting investors. I'm not actually sure if anyone made any money out of it. The man and I parted company fairly swiftly. The spiel then, as it is now, is that Jojoba oil mimics the oils secreted by our own skin, making it a perfect moisturiser and anti aging oil. It was also touted as a replacement for Sperm Whale oil in beauty products...a worthy claim indeed. Of course these days, we have a plethora of weird and wonderful wrinkle treatments, so Jojoba oil has been relegated to the 'alternative' basket. A shame as it's a fantastic product, which I personally have rediscovered in recent times. Following my success with making my own Goats Milk soap, and finding it an excellent anti-inflammatory cleanser for my sensitive skin, I decided to add the Jojoba Oil hiding in my vanity to my evening beauty regime. And I'm loving the results. I'm simply massaging a small coin sized amount of the oil into my freshly-washed-with-Goats-Milk-soap﻿ skin, and I already see results. Calmer, fresher skin, and a good feeling inside through not using any yucky chemicals. I guess the cooler weather here always has me scurrying for a more robust skin care routine, and the Goats Milk Soap and Jojoba Oil are doing the trick. Why not try it...you might like it AND save yourself a heap of cash too.